I’d heard a lot about Álvaro Castro, and tried his wines on several occasions, so I was looking forward to meeting him (right). I don’t like pigeonholing people, but if I were the sort of person who did, I’d have problems with Álvaro. 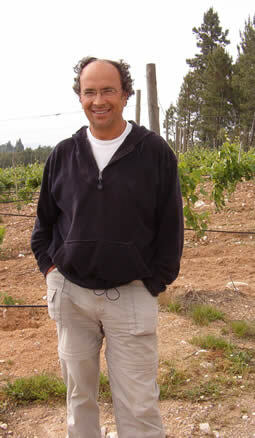 Immediately, I could tell he’s unconventional, perhaps a little shy in a nice sort of way, but also focused enough to want to make his sort of wines, without feeling the need to compromise or please the critics. We piled into his wonderful old Toyota Landcruiser (vintage c. 1980) and headed off to see the vines. Alvaro has two Quintas: Saes is where he lives and the winery is located, but the more dramatic is Pellada, on a hillside with wonderful views and a fantastic old building that he’s restoring from a semi-ruined state. This rather grand house is remote (there’s no power or mains water) and substantially proportioned, and will be wonderful when it’s finished. The landscape here is a little different to the rest of Dão. We’re getting close to the rugged Serra d’Estrela national park, and the vineyards aren’t planted in clearings in the pine trees as they are so commonly elsewhere in the region. There’s a wildness to Pellada. I like it. Afterwards it’s back to Saes where Dirk Niepoort is waiting. He’s just got back from Spain and has brought some food to prepare for dinner, which he’ll be cooking. Dirk is a very good cook indeed, but first it’s tasting time. Dirk and Alvaro have been working together on Dado, a Douro–Dão hybrid wine, so we’re off to the cellar for some fairly extensive barrel tasting of 2003 wines. First, a couple of old vine lots from Pellada. 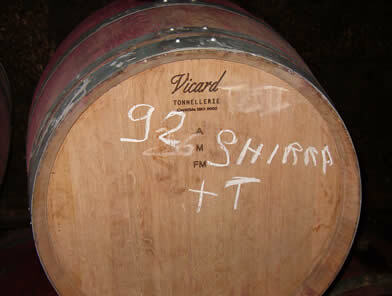 The first, in a Taransaud barrel, is intense, supple and vivid. The same wine from Francois Frères (Vosges and Allier) barrels is subtly different, with more spice character. It’s clearly a very fine wine, though, combining elegance and richness well. 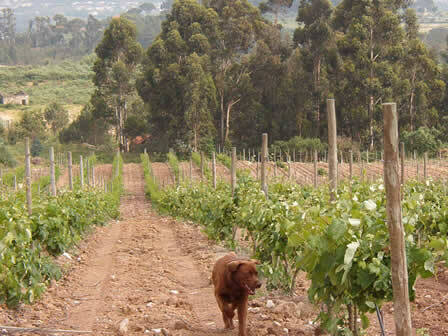 A 100% Touriga Nacional from a Vicard barrel is spicy and woody with a chocolatey richness. A Syrah (labelled 'Shirra', see right), also from Vicard, is lush with a spicy, chocolatey richness and lovely perfume. A Touriga in Vicard is amazing, with an explosively herby, aromatic, spicy nose. This is quite special. The next barrel is the same Touriga Nacional but it’s even better (this wine will go under the name of ‘Carousel’, apparently, although I may have misheard this): it is currently in a new Francois Frères barrel, but previously this wine had been in a new Vicard barrel. It’s spicy, structured, woody and intense. Dirk is very keen on this. Excited, even. The next wine is a pretty, approachable blend of Touriga and Tinta Roriz, and then we try a dense, structured wine that’s an old vine blend from Pellada. Finally, an oddity: two barrels of a still-fermenting botrytised white wine, harvested in mid-November. This comes from up near the Spanish border from a friend’s vineyard. It’s weird but very interesting. Overall, these 2003s are exciting wines with lots of potential and character. Some of them will be very special indeed. Before dinner we tried some finished wines. They are as follows (on to next page).